Blackpool Aviation Meeting 1910 Pathe - Aviators. "Lancashire aero club's successful aviation meeting. A. V. Roe of Manchester. The plucky aviator who uses a triplane of his own design and construction". Duration: 1 minutes 23 seconds. 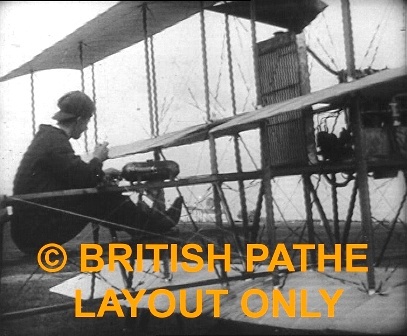 Aviator A. V. Roe from Manchester seated in triplane - looks like quite a primitive machine. Intertitle reads: "... Tetard on his biplane". Close up of Tetard seated on biplane, facing camera. Intertitle reads: " ... Chavez who broke the world's record for altitude in his Bleriot Monoplane". Close up of Chavez in plane. Intertitle reads: "... Drexel, who won the second prize for duration". Intertitle reads: " ... Jones (Robert Lorraine the actor) whose daring flight was a sensation of the meeting". Shot looking up from ground at Robert Lorraine seated in aeroplane. Intertitle reads: " ... Grace, and his mascot Towzer who never leaves his master and seems to enjoy the back draught of the propeller". Side view aviator Grace in his aeroplane. Close up of Grace's dog on ground beside aeroplane.